Death toll in Indonesia's earthquake-tsunami disaster passes 1,649 as aid operations continue. Relief and rescue operations continue inIndonesiaafter a massive earthquake and tsunami, as time runs out to find survivors one week after the dual disasters struck Sulawesi Island. 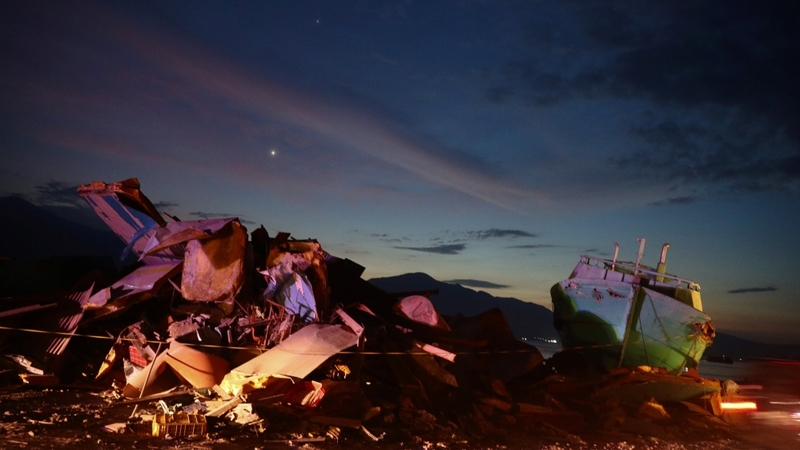 According to the Indonesian National Board for Disaster Management on Saturday, the death toll from the quake and tsunami has risen to 1,649. 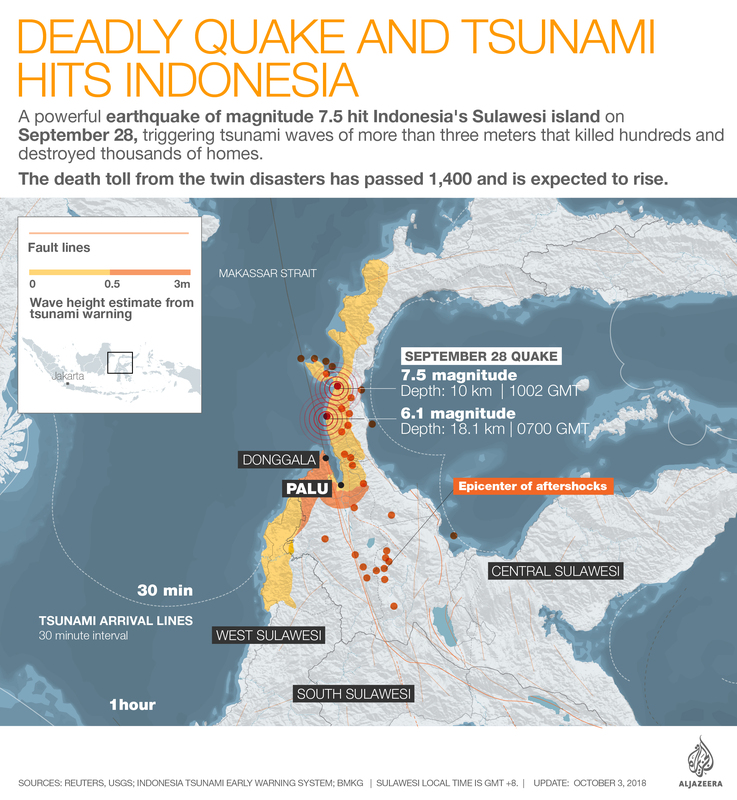 More than 70,000 homes were destroyed or damaged by the magnitude-7.5 quake that struck on September 28, launching waves as high as six metres that slammed into Sulawesi at 800 km/h. Rescuers issued a fresh public health warning on Saturday as more decaying corpses were unearthed from beneath the ruined city of Palu. There are fears that vast numbers of bodies could be buried beneath Petobo and Balaroa – two areas virtually wiped off the map. “Most of the bodies we have found are not intact and that poses a danger for the rescuers. We have to be very careful to avoid contamination,” Yusuf Latif, a spokesman for the country’s search and rescue effort told the AFP news agency. 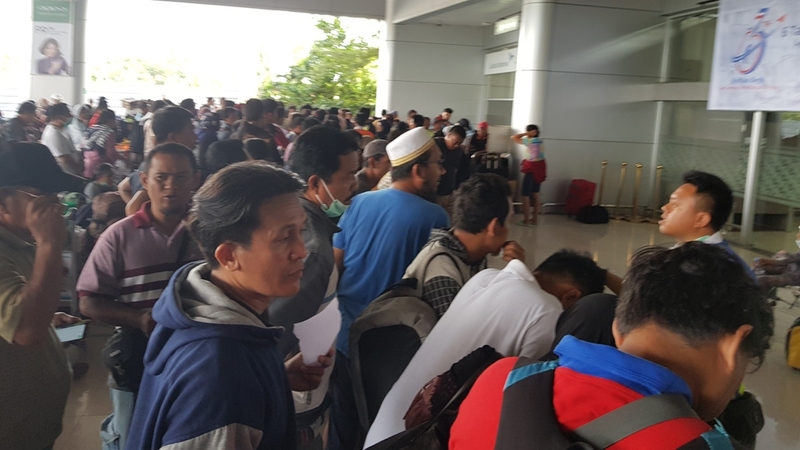 Also on Saturday, passengers faced a long wait at Palu airport due to cancellations, delays and overbooking of commercial flights, according to Al Jazeera’s Ted Regencia who was reporting from the disaster-struck region. Some passengers, with bookings from Friday, were only accommodated by the airlines the following day. Parts of the city, meanwhile, were trying to return to normality, with some shops and food stalls opening and electricity restored. In Palu, parks have become refugee camps for those whose houses have been destroyed and have nowhere else to go. “There is still a lack of basic supplies in the affected areas, including here in the heart of Palu city where people have been camping for a week,” said Al Jazeera’s Wayne Hay. “Despite all the money from the Indonesian government and offers of assistance from foreign governments, no one has been able to supply these people with temporary toilets or adequate shelter,” he said, reporting from Palu. Refugeessay they are grateful for the land to sleep on, but they need more help. “I can tell you there are some toilets over there, but they are full of excrement so I eat only once a day so I don’t have to go,” said Haji Ratnawati Tawaka, a Palu resident. TheUnited Nationshas said it is seeking $50.5m “for immediate relief” to help victims of the devastating quake and tsunami in Indonesia. The UN plan, published on Friday and developed in consultation with Indonesian government officials, outlined “how the humanitarian community working in the country will provide targeted, technical assistance”. The UN plan aims to provide help to 191,000 people over the next three months, according to a statement by the global body’s Indonesia office. According to UN estimates, 65,000 homes have suffered some form of damage, a figure that includes 10,000 homes “completely destroyed by the tsunami” and 15,000 homes severely damaged by theearthquake. 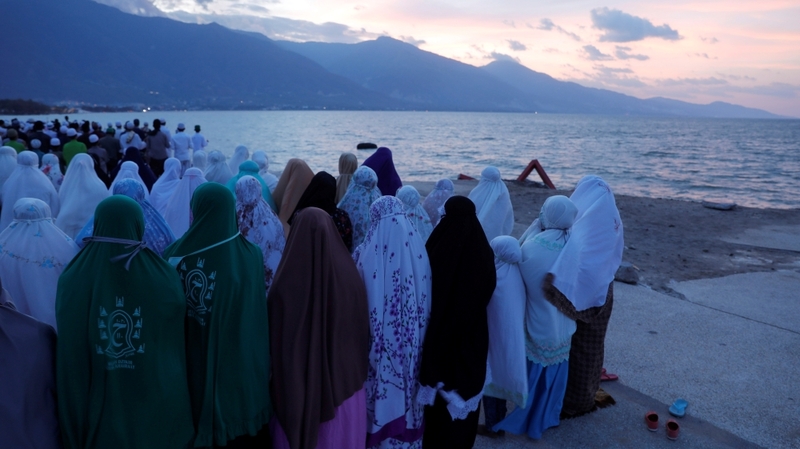 Hundreds of people gathered at Talise beach in Palu on Friday to attend a mass prayer for the victims one week after disaster wreaked havoc in the Muslim island of Sulawesi. 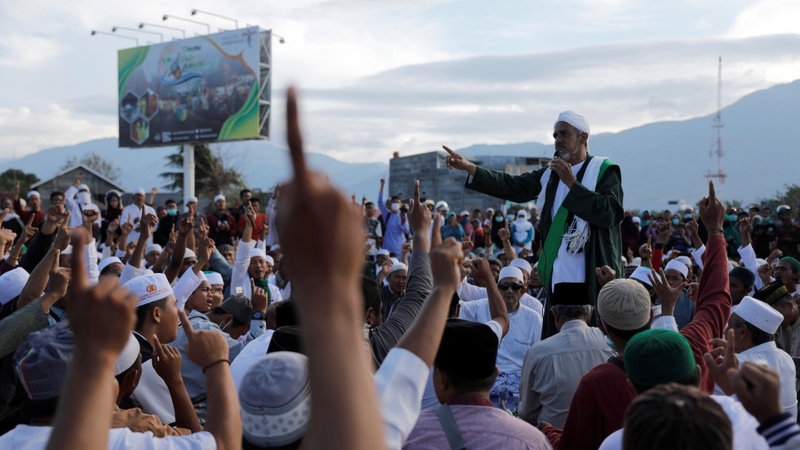 With many of the mosques completely destroyed by tsunami waves, Friday prayers were held outside in different parts of Palu city. Men in prayer caps sat on prayer mats in an open field, some weeping openly. Others braved the scorching sun as they listened to the mosque’s imam encouraging them to be courageous. 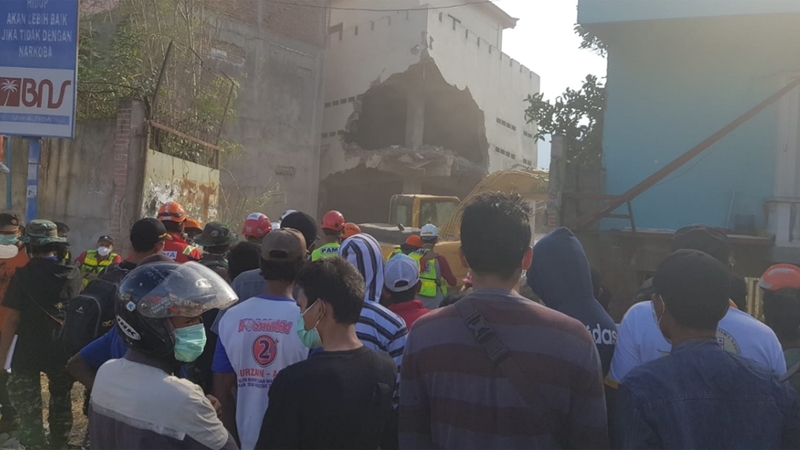 Sutopo Purwo Nugroho, Indonesia’s disaster management agency spokesman, said about 1,000 people may be buried in areas liquefied by the earthquake in Palu city’s Balaroa and Petobo. The areas were swallowed by three-metre deep mud. Search-and-rescue operations have been hindered because the land is still too wet to manoeuvre on. So far, only 26 survivors have been found in Petobo and 48 in Balaroa. “We will continue searching,” Sutopo said. I’m standing in a portion of Balaroa district of #Palu devastated by a 7.5 magnitude quake. It’s been a week since the disaster struck on Friday. Death toll so far is up to 1,400+. Nat’l disaster agency quoted village elders as saying over 1,000 people could still be missing. 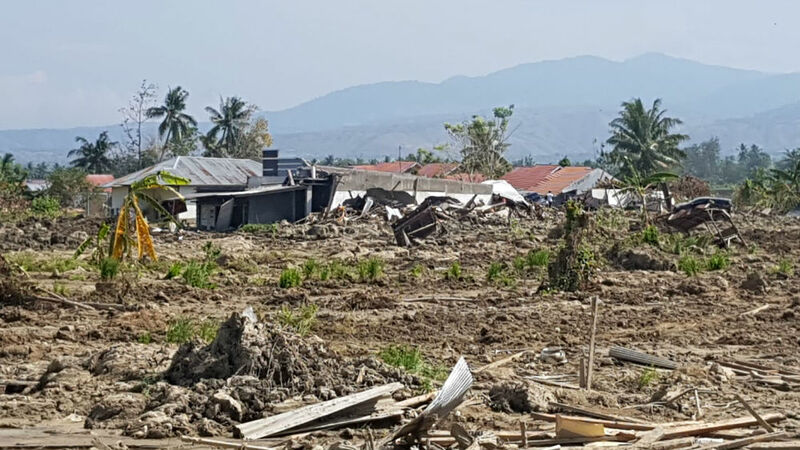 In the Palu neighbourhood of Balaroa, about 1,700 houses were buried when the earthquake caused soil to liquefy, the national rescue agency said. Liquefaction is a phenomenon where saturated sand and silt take on the characteristics of a liquid during the intense shaking of an earthquake. Among the more than 1,550 people killed in the quake-tsunami were 34 children at a Christian bible study camp that was hit by liquefaction. A French rescue team using high-tech equipment failed to find anyone alive under the rubble of a hotel in Indonesia’s central Sulawesi. A member of the French organisation, Pompiers de l’urgence, said on Thursday the team’s sensors “detected the presence of a victim” in the wreckage of the four-star Mercure Hotel in Palu. The device can pick up breathing and heartbeats, but the team also cautioned that gas leaks and other factors can result in false positives. On Friday, however, the resucers said no sign of life had been found by the equipment and the team was moving on to other areas. “Yesterday we had a heart beat and sign of breathing, there were no other movements so it means it was someone who was motionless, confined,” said Philippe Besson, president of the organisation. Rescue efforts since the September 28 quake have been greatly impeded by a shortage of heavy equipment. Search efforts focused on eight key locations on Friday, including a beach and the Balaroa area where the sheer force of the quake turned the earth temporarily to mush. “We have to use heavy equipment now because it is very difficult to sift through the rubble by hand,” Yusuf Latif, a spokesman for Indonesia’s search and rescue agency, told AFP news agency. 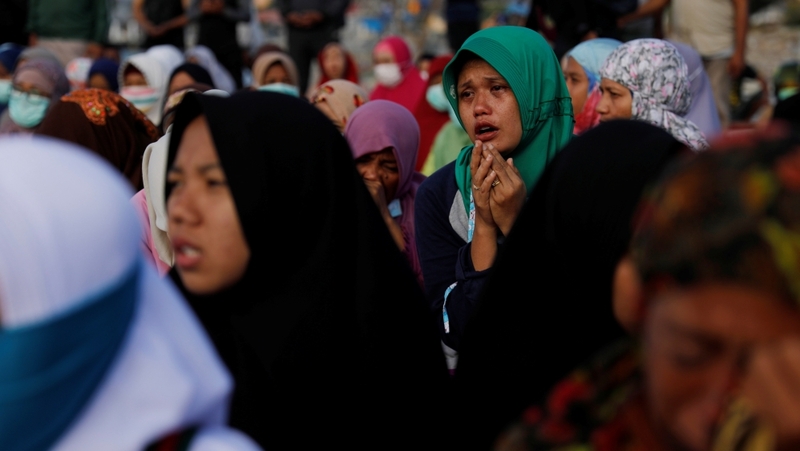 Local military spokesman Muhammad Thohir said the death toll had risen to 1,558. Survivors have ransacked shops and supply trucks in the hunt for basic necessities, prompting security forces to round up dozens of suspected looters and warn that they were prepared to open fire on thieves. Indonesia was initially reluctant to accept outside help, insisting its own military could handle the response, but as the scale of the devastation became clearer, President Joko Widodo agreed to allow in foreign aid. Governments from Australia to Britain are flying in supplies, the United Nations has pledged $15m to the relief effort, and aid groups including Save the Children and the Red Cross are also on the ground. There were signs of life returning to normal, with children playing in the streets, music blaring out of radios and electricity back up and running in most places. Power was restored and some shops reopened in Indonesia’s disaster-stricken city of Palu, The Associated Press said on Thursday. Traffic lights and televisions flickered back to life in the small city of 370,000 people, which has been the focus of the aid effort launched after last Friday’s magnitude 7.5 earthquake and tsunami on the west coast of Sulawesi island. While international help in searching for survivors has gathered pace, communities in more remote areas have been cut off by damaged roads, landslides and crippled communications. “There are so many challenges with this disaster, it’s never been so bad,” said Frida Sinta, an aid volunteer trying to get basic food and other supplies out to fellow residents of Palu. Al Jazeera’s Wayne Hay reports from Donggala, the first area hit by the tsunami, that aid has taken time to reach Donggala, as most of the rescue efforts after Friday’s devastating disasters focused on Palu City. “People have been complaining that they are being treated like second-class citizens here because they are not receiving the aid [other] areas have,” Hay said. “Slowly but surely, that is improving, the roads to Palu are opening so we are seeing some aid, some assistance, coming through here. Hay added: “The scene in Donggala is of devastation in the small, peaceful and once-picturesque fishing villages. As the tsunami came through here, it took absolutely everything with it. People’s homes, businesses and their livelihood, as the wave swept through here, into the bay towards Palu city itself. At least 92 people have been arrested for looting in areas devastated by the earthquake. Local television reported that the people arrested for looting were caught with goods including motor oil, tires, ceramic tiles, and farming equipment. They were from Palu and the surrounding districts struck by the disasters. Al Jazeera’s Ted Regencia, reporting from the Balaroa area in Palu, witnessed a man armed with a katana being arrested by the Indonesian army for stealing motorcycle spare parts. Indonesia’s military said it will shoot looters in the earthquake and tsunami-ravaged province of Sulawesi after desperate survivors emptied shops of food and water. Signs of desperation are growing with police officers forced to fire warning shots and tear gas to ward off people ransacking businesses. With food and clean water in short supply, survivors are battling thirst and hunger. “If there is looting again, we will quickly fire a warning shot and then shoot to immobilise,” Colonel Ida Dewa Agung Hadisaputra told AFP news agency. According to the UN’s humanitarian office, almost 200,000 people need urgent help, among them tens of thousands of children. Officials on the ground said while the government had invited offers of foreign help, there is still no “mechanism for this to be implemented”. International efforts to help survivors of Indonesia’s devastating earthquake and tsunami gathered pace on Thursday. 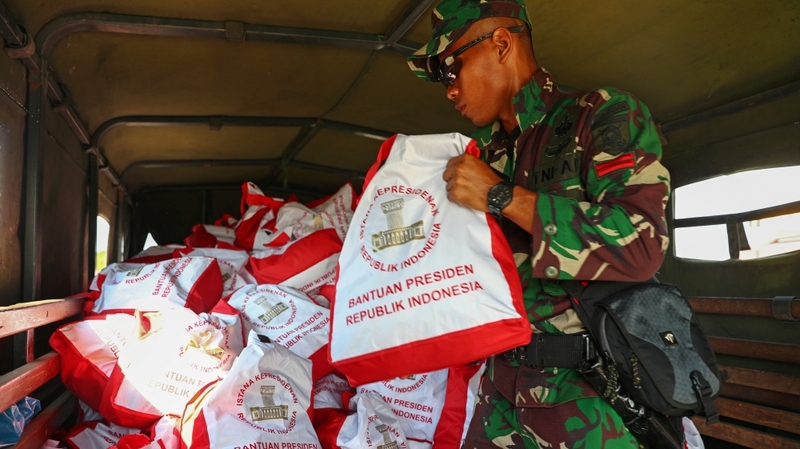 “The government of Indonesia is experienced and well-equipped in managing natural disasters, but sometimes, as with all other countries, outside help is also needed,” UN Under-Secretary-General for Humanitarian Affairs and Emergency Relief Coordinator Mark Lowcock said in a statement. He announced an allocation of $15m. The International Federation of Red Cross and Red Crescent Societies said it was appealing for $22m to help Indonesia. Some aid from the UK and Australia as also due to arrive on Thursday. In all, about 20 countries have offered help. A trickle of emergency aid is only now reaching parts of Sulawesi island and some increasingly desperate survivors are taking matters into their own hands. Climbing over reeking piles of sodden food and debris, a crowd on Wednesday searched a wrecked warehouse for anything they could salvage: cans of condensed milk, soft drinks, rice, candy and painkillers. Palu resident Rikardi Safarudin found the house his mother was in when the tsunami hit the small city on Friday. The house was among those carried hundreds of metres by the waves of mud. Aeroplanes bringing in aid supplies, humanitarian workers and volunteers from different countries continued to land at the Palu airport late on Wednesday. “We’ve seen them arrive with their own cargo of medical assistance and kits that they’ve brought in,” said Al Jazeera’s Jamila Alindogan, reporting from the Palu airport. “We’re also seeing an influx of forces, presence of the military as signs of reassurance from the government that life can be picked up here again and that security is very much in place,” she added. With many areas inaccessible and blocked, machines to clear the debris have also been brought in, Alindogan reported. “There are areas that remain closed off, where many civilians are still believed to be trapped, and this is a logistical issue,” she said. 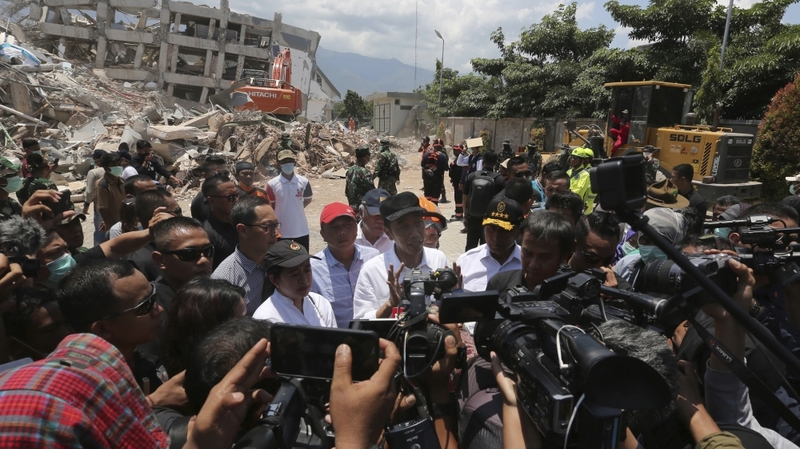 Indonesian President Joko Widodo has said that the evacuation process, cleaning and the search for victims in the quake-hit city of Palu are going according to plan. On his second visit to the affected area on Wednesday, Widodo stressed that the government wants to “immediately revive economic activity in markets and shops”. “The first step is evacuating, after that is rehabilitation and reconstruction,” he told Al Jazeera’s Andrew Thomas in Palu. During his visit, Widodo scanned different areas of devastation within the city, met some of the evacuees and went to a hospital. “His presence here signals that the government is in full control,” said Al Jazeera’s Alindogan. “It is going to be a long process, but the government is basically assuring the people of Indonesia that they are in charge and you can see that just by how things are moving here at the airport,” she added. 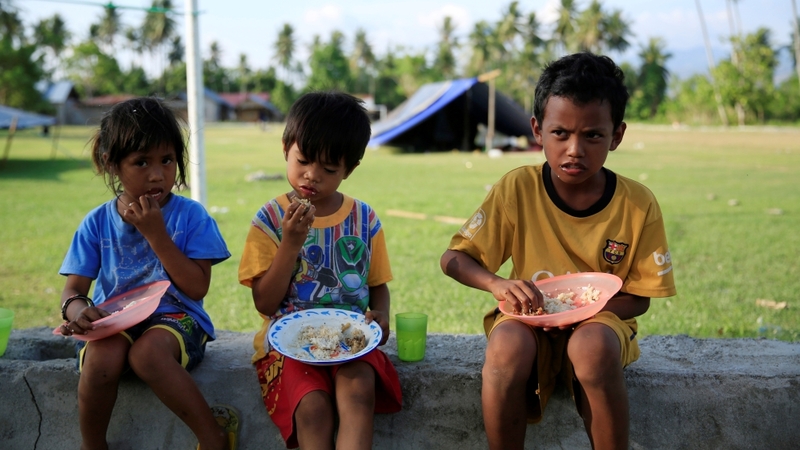 Survivors in Donggala, a region of 300,000 people north of Palu and closer to the epicentre of Friday’s earthquake, said they were scavenging for food in farms. Johnny Lim, a restaurant owner reached by telephone in Donggala town, told Reuters he was surviving on coconuts. In another part of Donggala, Ahmad Derajat said survivors were scavenging for food in fields and orchards. “What we’re relying on right now is food from farms and sharing whatever we find like sweet potatoes or bananas,” said Derajat whose house was swept away by the tsunami, leaving a jumble of furniture, collapsed tin roofs and wooden beams. 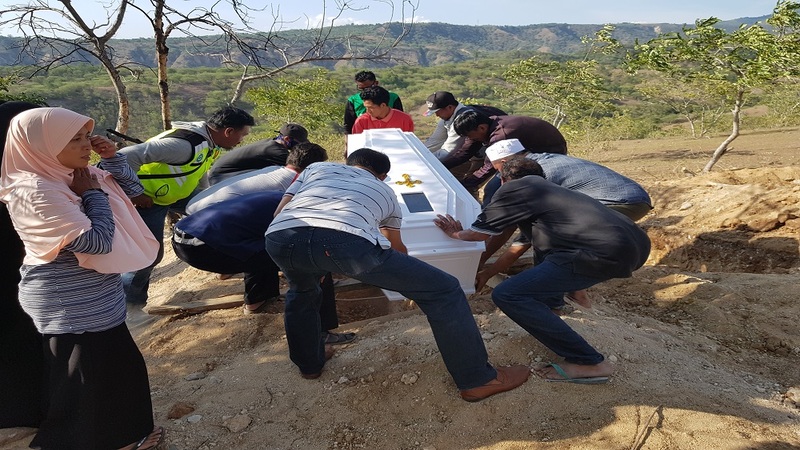 Aid worker Lian Gogali described a perilous situation in Donggala, which includes a string of cut-off, small towns along a coast road north of Palu. “Everyone is desperate for food and water. There’s no food, water, or gasoline. The government is missing,” Gogali told Reuters. She added that her aid group had only been able to send in a trickle of rations by motorbike. The official death toll from the magnitude 7.5 earthquake and tsunami that hit the west coast of Sulawesi island has passed 1,407. 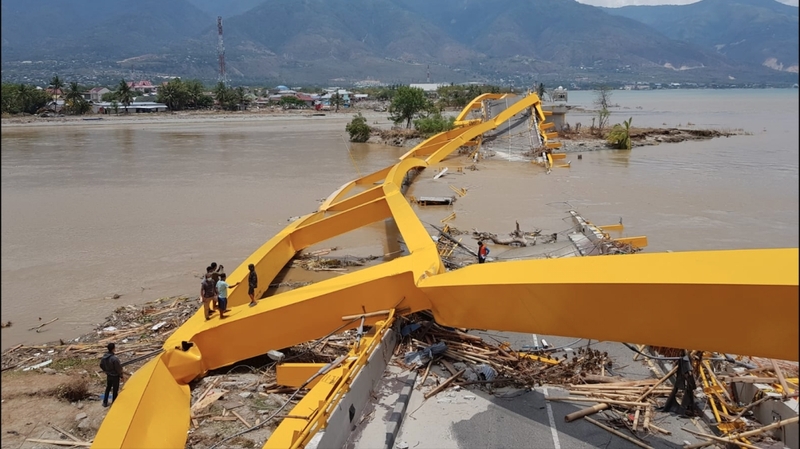 But officials fear the toll could soar, as most of the confirmed dead have come from Palu, a small city 1,500 km northeast of Jakarta and losses in remote areas remain unknown, as communications are down and bridges and roads have been destroyed or blocked by landslides. A volcano that erupted on Wednesday on disaster-struck Sulawesi island did not cause any additional casualties, Indonesia’s National Disaster Agency said. 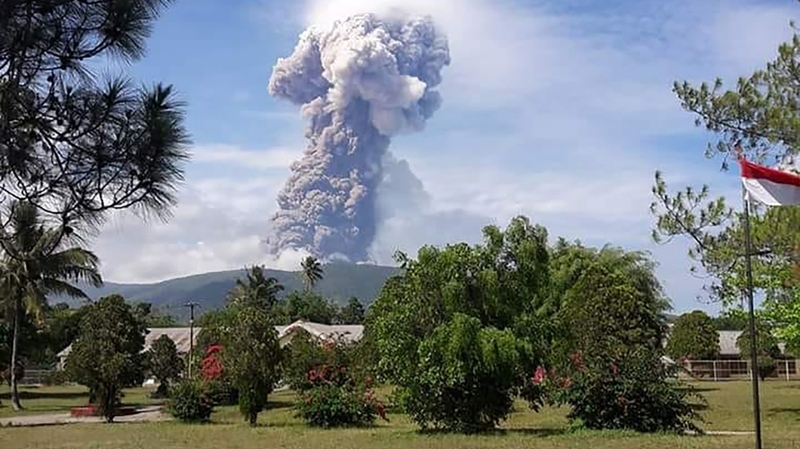 Mount Soputan, at the northern tip of Sulawesi Island, spewed a massive column of ash more than 6,000 metres into the air, but did not affect any residential areas, said Sutopo Purwo Nugroho, spokesperson for the agency. He dismissed concerns that the volcano’s eruption could affect planes transporting aid and supplies to the quake disaster areas in and around the city of Palu. “The volcanic ash from Mt Soputan did not head toward the airport in Palu, so it did not disrupt the airport and evacuation activities there,” he said. Residents in one Palu neighbourhood that was devastated by the twin quake-tsunami disaster clapped and cheered in excitement on Wednesday when a truck laden with supplies came in to their area. “I’m so happy,” said 63-year-old Heruwanto, while clutching a box of instant noodles. “I really haven’t eaten for three days,” he told The Associated Press news agency. Elsewhere in the city, desperate people searched for anything edible in the shell of a warehouse that tsunami waves pounded. People pulled out small cartons of milk, soft drinks, rice, sweets and painkillers from piles of sodden goods. Andi Arif told AP he was looking for medicine and food for his children. “There is some aid but we never got it,” he said, referring to government aid. More than 25 countries have offered assistance after Indonesian President Joko Widodo appealed for international help. Little of that, however, has reached the disaster zone. Al Jazeera’s Wayne Hay, reporting from the airport at Palu, the largest city heavily damaged by Friday’s disaster, said “there was no shortage of aid coming in”. “We are seeing medical supplies, food, water and body bags come in. But much of the aid does seem to be sitting at the airport and not getting out fast enough to the areas that need it most,” he said. An aircraft carrying 12,000 litres of fuel had arrived, and trucks with food were on the way with police escorts to guard against looters. 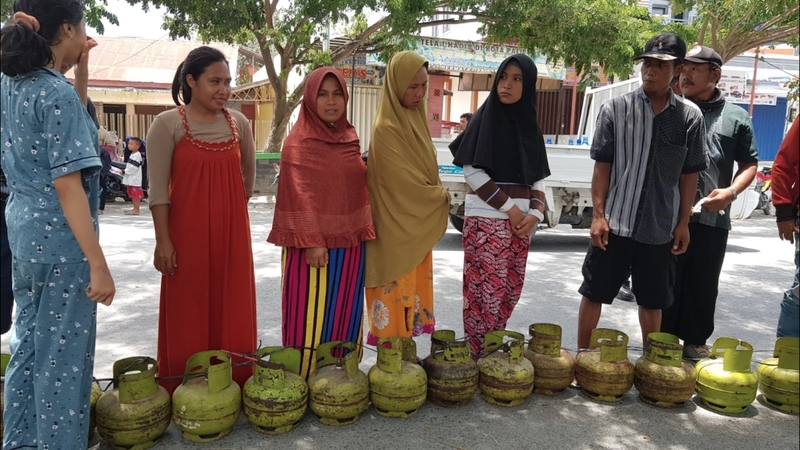 Many gas stations were inoperable, either because of quake damage or because of people stealing fuel, national disaster agency spokesman Sutopo Purwo Nugroho said in Jakarta. Indonesian military chief Hadi Tjahyanto said one armed soldier and one armed police officer would be placed on every aid truck and soldiers would be sent to secure markets, the airport and fuel depots to maintain order. He added that a Singaporean military transport plane will help evacuate victims from the airport in Palu. Australia announced it will send 50 medical professionals as part of a $3.6m aid package. The United States and China are among other countries that have offered assistance. At the quake zone, water is the main issue because most of the supply infrastructure has been damaged, UN deputy spokesman Farhan Haq told reporters at UN headquarters in New York. Haq said the Indonesian Ministry of Social Affairs has asked the UN children’s agency,UNICEF, to send social workers to the affected area to support children who are alone or became separated from their families. 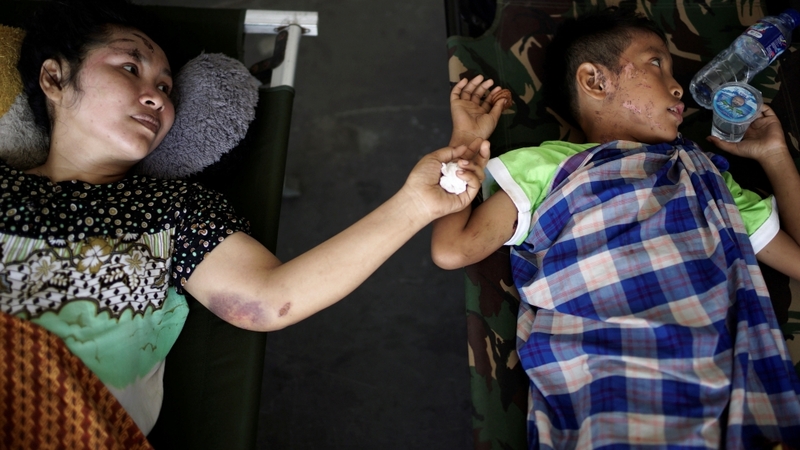 The death toll has increased to 1,407, according to Indonesia’s disaster agency. 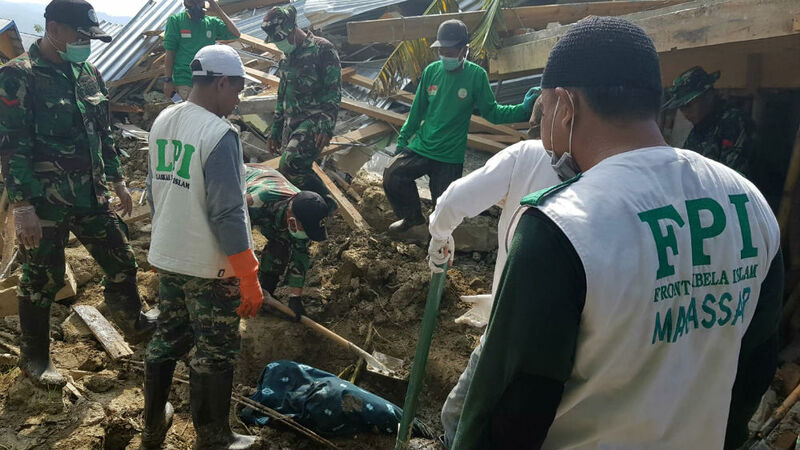 Sutopo Purwo Nugroho, spokesperson for the national disaster agency, said on Wednesday that 519 bodies have been buried as rescue workers scrambled to locate survivors around the ravaged city of Palu. Underlining the growing sense of urgency, Indonesian President Joko Widodo made his second visit to the disaster zone on Wednesday, putting on an orange hard hat to talk to rescue workers at a collapsed Palu hotel. The president called for reinforcements in the search for victims, after inspecting what he called an “evacuation” effort at the Hotel Roa Roa, where he said some 30 people lay buried in the ruins. “We’ll continue this process so all the victims can be retrieved,” he said. Rescue workers were scrambling on Wednesday to locate survivors around the ravaged seaside city of Palu, with officials saying they are “racing against time” to find anyone alive. 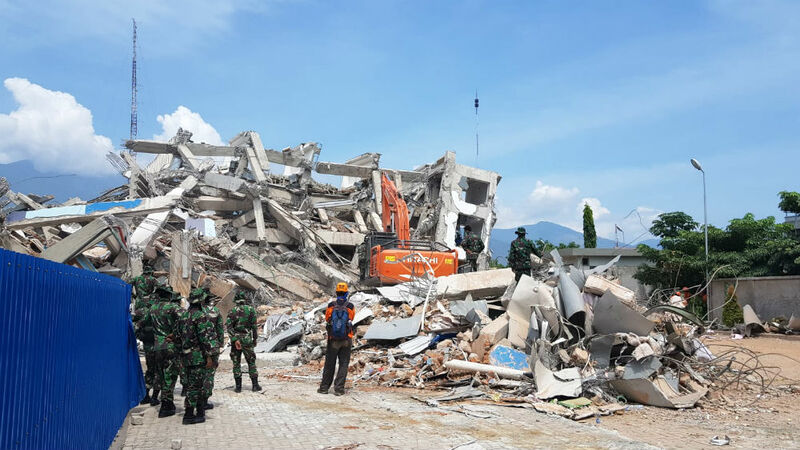 Rescuers were focusing on half a dozen key sites around Palu – the Hotel Roa-Roa where up to 60 people are still believed buried, a shopping mall, a restaurant and the Balaroa area where the sheer force of the quake temporarily liquified the earth. Authorities set a tentative deadline of Friday to find anyone still trapped under the rubble, at which point, the chances of finding survivors will dwindle to almost zero. At Palu’s stricken airport, hundreds of victims were waiting to board Indonesian military transport planes to be evacuated to Makassar, capital of South Sulawesi province. The injured and those with children received priority seating on the Hercules C-130 aircraft. “The evacuation was orderly and there was no panic. But they obviously looked tired and stressed out,” Al Jazeera’s Ted Regencia reported from the scene. Outside Palu’s Mutiara Al Jufri Airport, hundreds of others were camped out, some receiving medical treatment, others awaiting a chance to escape. There was mounting concern over Donggala, a region of 300,000 people north of Palu and closer to the epicentre, and two other districts – with a combined population of about 1.4 million. 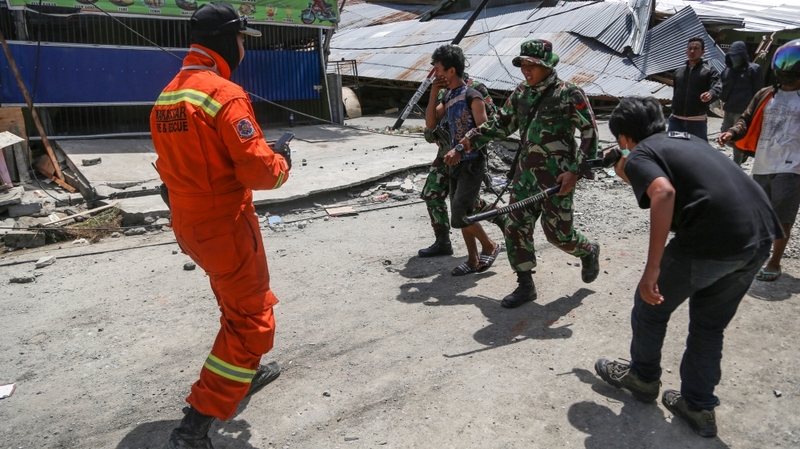 The situation in the affected areas is nightmarish,” Jan Gelfand, head of the International Federation of Red Cross and Red Crescent Societies (IFRC) office in Jakarta, said in a statement.